As a Christian resource centre we are here to serve you. We sell a huge range of Christian books, Bibles, Bible studies, CDs, DVDs, cards, beautiful gifts, and other Christian resources that can form a vital part of the church’s ministry, as well as equipping people to live their lives in the way that God intended. We also have a large children's resource area including Sunday School materials. Visit the shop in person or contact us for advice. We will try to price match or better any genuine price, so always ask us for a quote. Remember it is not always cheaper online. We also offer a mail order service. So whatever your needs contact us and we try our best to help and resource you. This is your place to find out what going on in the community. ​SPECIAL PRICE £6.99 off if you buy in store during April. The Mystery of the Shemitah: The 3,000-Year-Old Mystery That Holds the Secret of America's Future, the World's Future, and Your Future! Pete Greig has been teaching on prayer - and leading a non-stop prayer movement - for twenty years. Now, for the first time, he puts his life's work into a simple book written for everybody - an answer to the question everyone ultimately asks: how do I pray? This down-to-earth introduction to prayer will guide you deeper in your relationship with God - making you more centred, more aware of God's voice, more likely to see breakthroughs and more able to make sense of your unanswered prayers, too. (Play Pete's special message for Canaan above). 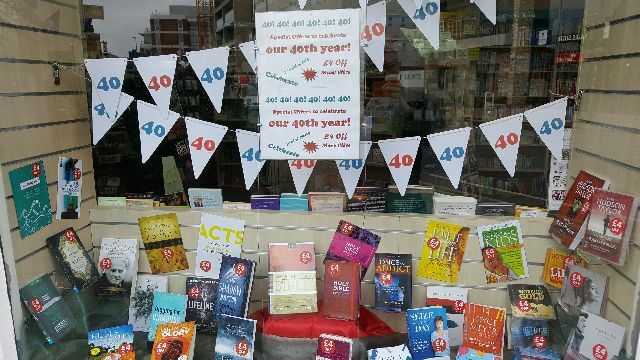 This year we are celebrating our 40th year, with special events and loads of special offers in store, whilst stocks last. We have lots of items with £4 off and many more reduced to only £4. To see a selection, click here. We will also have special exclusive shopping evenings for groups, and will be arranging 4 special free events. So watch this space for more details, subscribe to our newsletter, or join our facebook group, by clicking on the facebook logo above. Don’t owe anything to anyone, except your outstanding debt to continually love one another, for the one who learns to love has fulfilled every requirement of the law.